Master sculptor Malcolm DeMille created the one of a kind trophy on display this weekend at the Diamond Resorts Invitational. The cast polished bronze perpetual trophy is a realistic interpretation of a golfer in full swing set behind the classic Diamond Resorts logo capturing the essence of the tournament. 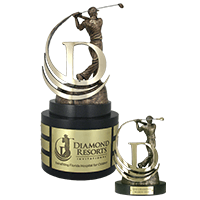 The team at Malcolm DeMille also created Prizes for the Diamond Resorts Invitational - Brian Gay Pro-Am. The Pro-Am winners will receive sleek brushed edge Trophy Trays featuring the Diamond Resorts Invitational logo. Best of luck to all the participants!